At a PLAN-Boulder County forum on August 9, John Tayer, the disarming new president and CEO of the Boulder Chamber, called for Boulder to become “a global capital of innovation,” while outlining the Chamber’s new “Innovation Blueprint 3.0,” and addressing questions and comments from the audience on a variety of topics. Each of these elements, in turn, included several more specific proposals. Under “strengthening the business innovation network,” he recommended, among other actions, the expansion of mentoring and training programs for entrepreneurs and small businesses, and the facilitation of exchanges between university students and faculty, laboratory scientists and business leaders. Under “advancing innovative policy solutions,” he advocated such measures as aggressive and early representation of “the balanced business perspective” in policy debates, and encouragement of public-private partnerships to accelerate policy implementation. With respect to more innovation investment, Tayer commented that Colorado is a “fly-over state” which big-time financiers cross at an altitude of about 35,000 feet on their way between New York and California. He pronounced additional capital to be critical to the program to turn Boulder into a “global capital of innovation.” He observed that efforts to lure venture capitalists from Silicon Valley to sink money into Boulder would be futile, because they are a tight-knit community that believes that it enjoys ample investment opportunities in its immediate vicinity. Eighty percent of venture capital is invested within 50 miles of the investors’ home towns, he remarked. However, Tayer suggested that campaigns targeting investors in much smaller regional centers, such as Omaha or Des Moines, would be fruitful. He also maintained that Boulder should feature in interactions with potential financiers of “industry clusters,” such as natural foods, carbon-neutral energy, outdoor equipment, and aerospace businesses, in which Boulder commands strong market positions. As to infrastructure, Tayer argued for both a “business innovation office center” and a “conference center.” The “business innovation office center” that he seeks would feature an “inspiring” LEED-certified design, provide a range of meeting room sizes and temporary incubation space for start-up businesses and/or a business relocation service, and be located close to local government offices to facilitate collaborative policy engagement. He observed that Boulder currently offers spaces for conferences of up to 400 people. But he contended that the city badly needs a conference center that can hold 500 to 1,000 people, including “break-out” rooms and dining facilities. He readily recognized that Boulder’s business leaders and government officials—along, at times, with CU representatives—have struggled to create such a conference center since 2001 without any success. After his lively presentation of the Innovation Blueprint, Tayer entertained questions and comments from the audience on any and all subjects—a gesture that reminded some boxing fans of the moment in the first Ali-Frazier bout in 1969 when “Smoky Joe” deliberately dropped his guard and invited Ali to hit him. Like Frazier, Tayer remained standing after the barrage. To detractors of the Chamber, Tayer declared that it seeks to become the “Chamber of How,” rather than the “Chamber of No,” that it intended to support business interests “in harmony with the values of the community,” and that it wants to act as “a constructive player in the community.” “The business folks are this community,” he asserted. Tayer concurred with those who demanded a revitalization of the arts in Boulder and announced that the Chamber is forming an arts council. He also asserted that the Chamber is trying to attract more non-profit organizations as members and place greater emphasis on their importance to the community. Although the “Innovation Blueprint” generally received a positive response from the audience, some asked whether its inevitable consequence would be to attract more employers and employees to Boulder, increase in-commuting and energy use, drive up housing prices, and exacerbate existing strains on government services. Tayer generally conceded that developers need to pay for the costs of growth. He also recognized that there are limits to growth and called for a “community debate” about where those limits lie. 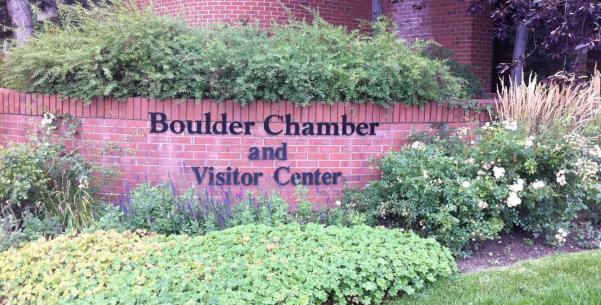 The Chamber’s reservations about the city’s decision to municipalize the local electrical system were also questioned, and Xcel was lambasted as an obstacle to innovation in Boulder, rather than a promoter of it. He did not contest the example given of Xcel’s restraining effect on innovation. He noted that the company is encumbered by a large bureaucracy and speculated that some of its final positions during the city’s “working group” this spring and summer were determined by management in Minneapolis, rather than Denver. However, he asserted that the Chamber is “conservative” in that it tries to conserve the best aspects of the past and present—and that it “wants to be convinced” that municipalization will truly serve the interests of the community before throwing support behind it.